This article is about the American actor. For the British 18th century agriculturalist, see John Billingsley (agriculturist). For the voice actor, see Beau Billingslea. 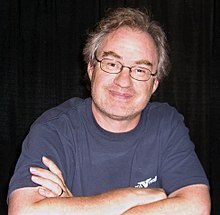 John Billingsley (/ˈbɪlɪŋɡzli/, born May 20, 1960) is an American actor known for his role as Doctor Phlox on the television series Star Trek: Enterprise. Billingsley was born in Media, Pennsylvania, and subsequently lived in Huntsville, Alabama and Slidell, Louisiana before his family settled in Weston, Connecticut. He graduated from Bennington College in 1982. Billingsley's first on-screen role was in 1991 as a difficult customer making a return in a customer service training video produced by Nintendo of America. He made an appearance in "It Happened in Juneau", a third-season episode of the TV comedy-drama Northern Exposure, playing a patient treated by Marilyn. Billingsley made an appearance in The X-Files episode entitled "Three of a Kind", playing a friend of the Lone Gunmen who turns out to be a government spy. He played Dr. John Fallow in a West Wing episode that featured the Gall–Peters projection map (season 2, episode 16). He was cast in the role of Professor Miles Ballard in the short-lived television series The Others and then as the Denobulan Doctor Phlox in the fifth live action Star Trek series, Star Trek: Enterprise, which ran for four seasons. He also played himself in an episode of Roswell that used the Enterprise set. He also starred in the independent film Breathing Hard (2000) in the same year. In 2002, he was a guest star in an episode of Stargate SG-1, playing a scientist who is also a Trekkie, "worship[ping] at the altar of Roddenberry". Billingsley played a supporting role in the 2003 thriller Out of Time starring as medical examiner and best friend to the chief of police played by Denzel Washington. Billingsley is well known to fans of the series Cold Case for his guest appearance in the show's second season, playing serial killer George Marks, the only killer on the show to have gotten away with murder. Billingsley would later reprise the role in the season finale, in which Marks was killed. He also appeared as a blunt force victim in the first season of Six Feet Under, in the episode "The New Person". Billingsley appeared in the first season of the series Prison Break as the mysterious Terrence Steadman, brother of the Vice President, whose death is faked to frame Lincoln Burrows for murder. Soon after, he was cast as a regular on the series The Nine. This left him unable to continue his role as Steadman, and he was replaced in the role by Jeff Perry. In 2005, he played the voice of Trask in Ultimate Spider-Man. In November 2006, Billingsley portrayed William Bradford on two episodes of the podcast The Radio Adventures of Dr. Floyd. In May 2007 he appeared on NCIS as a blind photographer in the episode, "In The Dark". He appeared in the seventh season of 24 as a recurring character. On October 8, 2007, he also made a guest appearance on Journeyman as Alan Platt. Billingsley played Prof. Harry, a biologist, in the 2007 independent science fiction film The Man from Earth. He also made a guest appearance in an October 2007 episode of CSI: Crime Scene Investigation, and in 2006 on the spinoff series CSI: NY. Billingsley appeared as Jacob Nolston in "Crash Into Me", a two-part, fourth-season episode of the TV drama Grey's Anatomy. Billingsley and his wife have also appeared as themselves on the HGTV series My House Is Worth What?, in which a real estate expert toured their home and provided commentary for viewers before providing an appraisal. In 2008, Billingsley had a supporting role in several episodes of the HBO series True Blood as coroner Mike Spencer. In May of that year, he guest starred as John Harris, the father of the Kiss-Me-Not Killer, in "Never Tell", an episode of Women's Murder Club. He appeared in the disaster film 2012, which was released on November 13, 2009, as Professor Frederic West, an American scientist. He subsequently appeared on the ABC series Scrubs in December 2009. In August 2010, he guest starred in an episode of the TNT series Leverage as Coswell, the head of security at the Boston Museum of Art and Antiquities. In November that year he guest starred as amateur psychic Ellis Mars in "Red Moon", an episode of The Mentalist. In February 2011 Billingsley played Gidger in the Richard Greenberg's play The Violet Hour in Los Angeles. In August 2011, Billingsley starred in an episode of the USA Network drama Suits as the company accountant who is being released for never finishing university. In October 2012 Billingsley starred in the film Trade of Innocents alongside Dermot Mulroney and Mira Sorvino. On February 12, 2013, a web comedy video was released on Yahoo! Screens under the title "Forwarders" that featured Billingsley as an Dr. Alan Cooper, a psychologist and expert on compulsive e-mail forwarding. That same year he completed filming of the independent film Red Line. On January 7, 2014, CBS television premiered the science fiction drama Intelligence, on which Billingsley played Dr. Shenandoah Cassidy, the inventor of an implantable microchip that acts as an interface between a human mind and electronic devices. In November 2014, Billingsley guest-starred in the CBS crime drama series, Hawaii Five-0, playing lawyer Eugene Goodman in the Season 5 episode, "Ka Hana Malu". In May 2015, Billingsley appeared in the second season of the AMC period drama, Turn: Washington's Spies, playing Samuel Townsend, father of American Revolutionary spy, Robert Townsend. He later returned to the role for the third season. In July 2017, he appeared as Doctor Ben in the Showtime revival of Twin Peaks. Billingsley is married to fellow actor Bonita Friedericy. She first became interested in him after seeing him perform in a stage production of Great Expectations. Friedericy appeared with Billingsley in "Regeneration", a 2003 episode of Star Trek: Enterprise in which she played Rooney. The couple have subsequently appeared in other productions together. ^ a b "Theater: Guest Artist Bios: John Billingsley" Archived 2013-11-13 at the Wayback Machine. Occidental College. October 4, 2012. ^ "Intelligence Cast: John Billingsley". CBS.com. Retrieved August 23, 2014. ^ "John Billingsley: Bio". Trademark Talent. Retrieved August 23, 2014. ^ Anthony, Darin (February 9, 2011). "Now Is the Hour for All Good Artists". LA Stage Times. ^ Savage, Sohpia (August 23, 2012). "'Trade of Innocents' Chosen for Creative Coalition's Spotlight Initiative". IndieWire. ^ "Forwarders". Yahoo! Screens. February 12, 2013. ^ "John Billingsley Remembers Dear Doctor". StarTrek.com. January 23, 2013. ^ "Intelligence Cast". CBS. Retrieved January 26, 2014. ^ "John Billingsley and Bonita Friedericy Interview Part 2". startrek.com. Retrieved November 13, 2013. ^ "John Billingsley". Star Trek Cruise. Retrieved November 13, 2013. ^ Winert, Laura (July 28, 2004). "ACTORS' DIALOGUE - Bonita Friedericy & John Billingsley". Backstage. ^ "Regeneration". Star Trek: Enterprise. Season 2. Episode 23. May 7, 2003. UPN. ^ "Kevin Sorbo, John Billingsley and Bonita Friedericy Star in New Audio Drama to Benefit 'A World Fit For Kids'". PR Newswire. November 18, 2010. Wikimedia Commons has media related to John Billingsley. This page was last edited on 26 April 2019, at 03:35 (UTC).